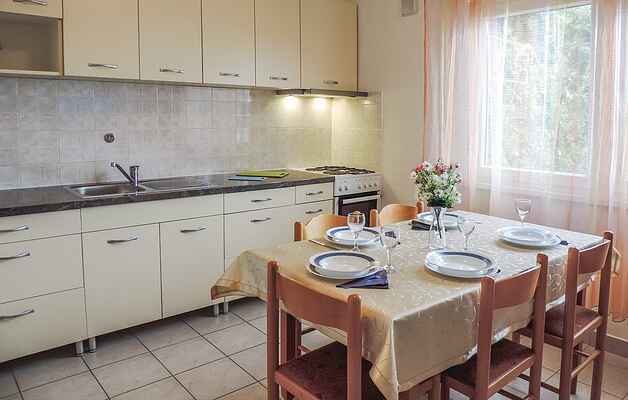 In the tourist town Rabac, the so-called "Pearl of the Kvarner", which is known for the most beautiful beaches in Istria and crystal clear sea water, is located this holiday apartment with a wonderful sea view. It is situated in a good position, close to the beach and is therefore suitable for a family holiday. The apartment has two bedrooms, where the bed in the bedroom no. 2 can be pushed together or apart as required. Within walking distance you reach the beach, shops and restaurants and in the evening you can make romantic walks along the promenade. It is also recommended to visit the old town of Labin and the Amphitheater in Pula.